MA: Davis Publications, Inc., 1986 (p. 120). A brief description and one photograph of the Library. as a whole. Illustrations, plans, section. Brown, Jack Perry. Louis I. Kahn: a Bibliography. New York: Garland, 1987. Writings by and about Louis Kahn, arranged chronologically. Bibliography A-190. Monticello, IL: Vance Bibliographies, 1980 (p. 10). which includes some non-English language articles. Drexler, Arthur. "Louis Kahn." In Transformations in Modern Architecture. New York: Museum of Modern Art, 1979 (pp. 102-105). great refinement using the simplest means...."
plans. In Japanese and English. Chiefly illustrations and diagrams with brief descriptions. Huxtable, Ada Louise. 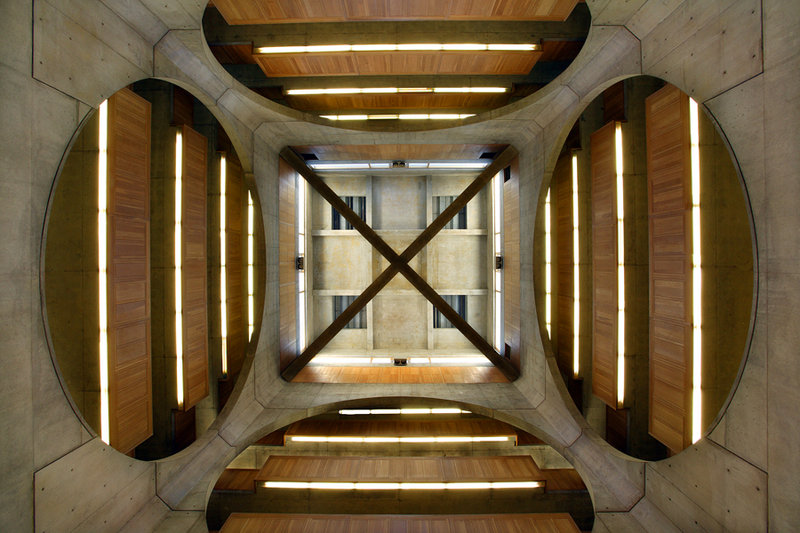 "Louis Kahn: Exeter Library." In Kicked a Building Lately? New York: Quadrangle/New York Times Book Co., 1976 (pp. 95-98). Times of Oct. 23,1972, which is described below. Routledge, 2008 (pp. 95-96; 106-107). A description of the Library and its place in the tradition of library architecture. Times, 23 October 1972, pp.23-24. New Haven/London: Yale University Press, 2005 (pp. 254-260). Commission. Vol 4. New York: Garland, 1987 (pp. 382-453). Kahn's drawings and sketches for the Academy Library. Kahn, Louis I. What Will Be Has Always Been: the Words of Louis I. Kahn. Comments on the Library by Kahn, reprinted from various other sources. Encyclopaedia Britannica Educational Corp., 1973 (pp. 315-316). Washington University and Phillips Exeter Academy Libraries." d'Arquitectes de Catalunya, 1989 (pp. 72-131). and Phillips Exeter Academy library. Text in English and Spanish.